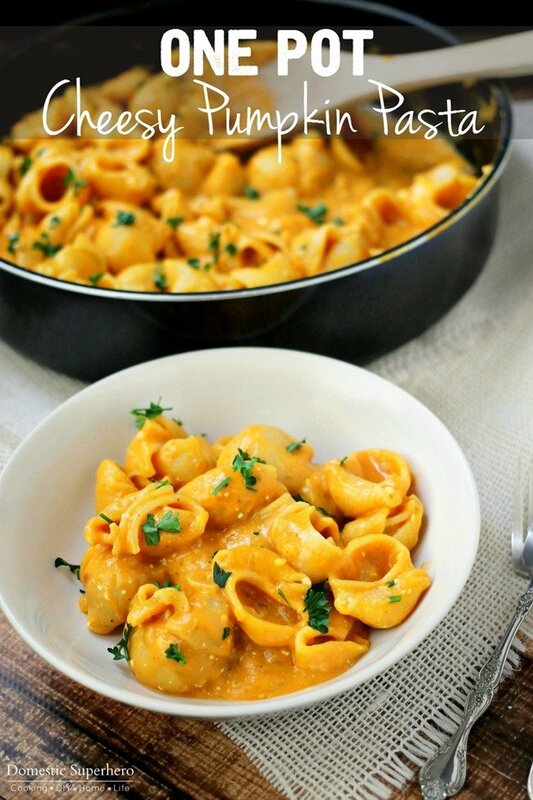 One Pot Cheesy Pumpkin Pasta is creamy and comforting with cheese and pumpkin paired together in this delicious one pot meal! In a stockpot or deep sided skillet, add noodles, onion, garlic, vegetable broth, pumpkin puree, red pepper flakes, salt, pepper, and nutmeg. Stir to blend together, and put on the stove over medium/high heat. Bring to a boil, then cover, reduce heat and let simmer for 10 minutes. Uncover, stir, cover, simmer for 2-4 more minutes, or until pasta is al dente. Add butter and cream cheese cubes, stir continuously until the cheese is melted and incorporated. Serve and top with parsley if desired. Add salt and pepper to taste. Like One Pot Meals as much as I do? Check out some of my other recipes! 0 Response to "One Pot Cheesy Pumpkin Pasta"